For the last several years, I’ve been doing a lot of travel through LAX, and generally I’ll get a hotel room in El Segundo the night. As a result, I’ve had a lot of opportunity to explore Manhattan Beach (the next town over). 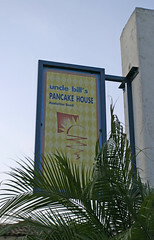 Several times, I’ve walked by Uncle Bill’s Pancake House, but have been unable to try it out since I was there in the evening, and my flight times in the morning have been early enough to prohibit a breakfast visit. Until last week, when I had an outgoing flight at a much more comfortable 8:25 in the morning, allowing me to have a quick trip to Uncle Bill’s right as they opened. I’m glad I was able to get there, since I enjoyed my breakfast. 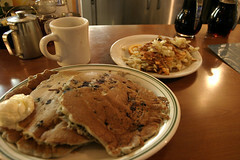 They had some really good blueberry pancakes. Fluffy, but still having the nice firmness I like from a good buttermilk pancake, and a nice gentle crisp. Definitely top-tier pancakes. The hashbrowns were very good as well, with a slightly coarser grate than most, but a nice soft interior and a good crisp sear on outside. Some of the better hashbrowns I’ve had recently, reminiscent of my favorite hash browns from Al’s Breakfast in Minneapolis. Definitely a solid breakfast, and there were several items on the menu that sound interesting enough to come back and try them as well, such as the potatoes stroganoff, or a bacon waffle.